MOLLUSCA : NUDIBRANCHIA : Scyllaeidae SNAILS, SLUGS, ETC. Description: This nudibranch is widespread in the central ocean basins, associated with drifting weed such as Sargassum bacciferum. It is green or brown in colour with scattered white patches. There are two pairs of lateral lobes, which are flattened and bear small branching gills on their upper sides. The large rhinophore sheaths surround lamellate rhinophores and have a flap on their posterior surfaces. 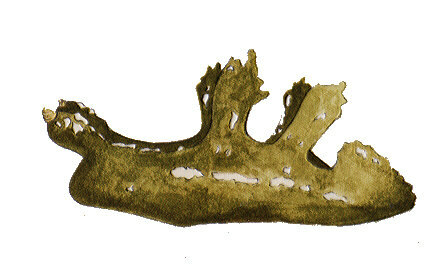 The whole body is irregular in outline providing good camouflage amongst floating Sargassum. The animal can swim upwards by flexing its body vigorously, an important ability for a nudibranch which drifts about the oceans. Habitat: This species feeds on tiny hydroids growing on the Sargassum weed with which it is associated. Distribution: Scyllaea is a vagrant in British Waters, belonging in the Sargasso region off the Caribbean Sea. There appear to be no recent records, but it could turn up stranded on any western coast after gales in the Atlantic. Four flattened ceratal growths on the sides of the body. Green or brown colour with white patches. Picton, B.E. & Morrow, C.C. (2016). Scyllaea pelagica Linnaeus, 1758. [In] Encyclopedia of Marine Life of Britain and Ireland.